Jump for joy and shout down the rafters for the 14-foot Hot Dog stuffed pizza crust is here! Well, actually it’s over there in the UK, but Pizza Hut’s spectacular bit of fast food fun is soon to arrive state-side. As a connoisseur of conservative tastes, I prefer my three slices served the more traditional way. After all, why mess with the perfect union of gluten and dairy? But I guess it takes all kinds of tastes to keep the pizza pie business thriving. So hot dogs and pizza it is. Yuck. This entry was posted in Personal/Home and tagged pizza, Pizza Hut. Bookmark the permalink. 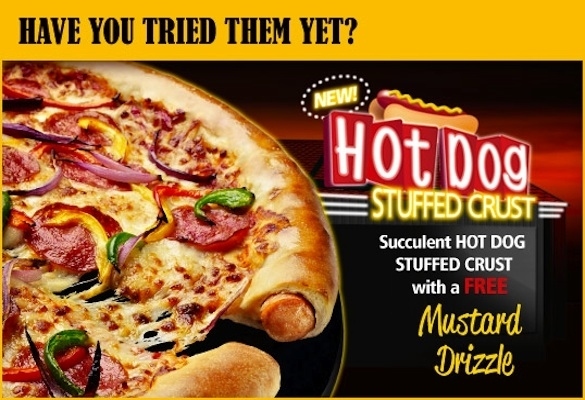 2 Responses to The Hot Dog Stuffed Pizza is Here! Thankful for the “free” mustard drizzle. And yuck is right — nothing good will come from eating this. How confusing for the pizza and how humiliating for the HOT DOG! !